Born on May 17, 1958, Di’Anno grew up in England – spending his teenage years singing in various rock bands and working as a butcher and chef. He befriended bass player Steve Harris, who was looking to find a replacement for a singer that just left his up-and-coming heavy metal band in 1977, Iron Maiden. Di’Anno wasn’t that impressed by what he’d previously seen of the band but decided to be tried out for the band, and got the job immediately. Iron Maiden soon found themselves as part of the New Wave of British Heavy Metal movement. 1979 saw the release of Maiden’s self-issued debut recording, The Soundhouse Tapes, which instantly sold out its initial pressing as the band built a devoted following. Signed to EMI/Capitol shortly thereafter, Maiden set out on conquering the rest of the world. 1980’s self-titled release “Iron Maiden” quickly became a classic and influential debut, as the band merged a punk energy with metal riffs, serving as the blueprint for such future hard rock genres as thrash and speed metal. What also made the band more noticeable from all of the other Metal bands of that time was the look and image of their frontman/Di’Anno who refused to conform to the regular metal look, but instead chose to stick to his own Punk/Jack the Lad type look and attitude. 1981 saw the release of their sophomore effort, “Killers”, as well as a live EP, “Maiden Japan”. Despite world-wide success lurking just around the corner, Di’Anno departed from the band by the fall of 1981 (he’s since admitted that he was partying a bit too hard around the time of his departure from Maiden). 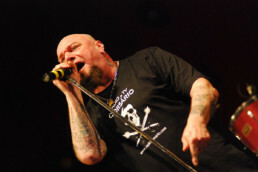 However DiAnno’s unique and extremely powerful voice had made a huge impression on rock music fans the world over, and also gained him an army of fans due to the sales of more than 20 million copies of the first two Iron Maiden albums featuring Paul’s unique vocal talent. In his post-Maiden career, Di’Anno has issued numerous albums, as both a solo artist and as a member of such bands as Gogmagog, Battlezone and Killers and he has been featured (either as the artist or as a guest) on more than 60 albums released world-wide. As a confirmed icon of the metal genre Di’anno is constantly gigging (from 2000 till 2003 with his former band Killers, now with his new band Screaming Monkey) throughout all of Europe Canada, South America and just recently in India where he has just landed his first film role in a Bollywood movie. Di’Anno has even had time to have his first book/autobiography released entitled “The Beast” which is a no holds barred journey through his turbulent and often disturbing lifestyle throughout the last two decades. Although he only appeared on the first two Maiden albums, Maiden’s work with Paul Di’Anno remains among metal’s all-time finest, and to this day those two albums are idolised and thought of as “The All Time Classics” by most Metal fans and musicians alike throughout the World.